To try and sum this book up is difficult. 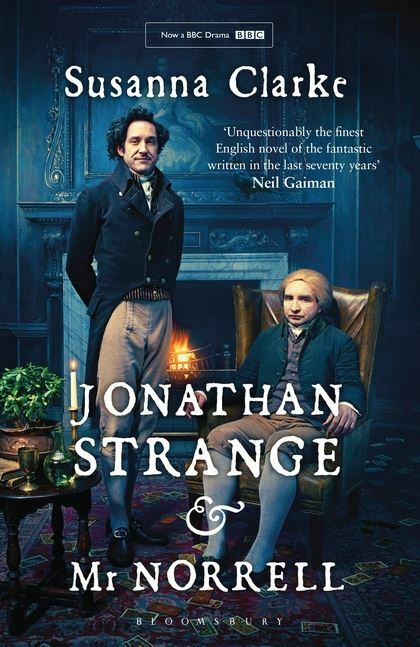 Jonathan Strange & Mr Norrell is a book that spans 1005 pages, it is modern yet reads like something by Dickens, it’s a slow burn that builds up ever so gradually and to try and summarise it in to a review and do it justice, I feel, is an impossibility. This is going to be a long review which tells very little as I don’t want to spoil anything for anyone who does want to read this! I’m going to break from my mould of reviews to give this a quick taster to anyone who has looked at the sheer enormity of this book and been put off, as someone who was really dubious as to whether this book was going to be for me, I just want to give a brief indication of the reading experience for this, because 1000 page books are daunting for even the most avid of readers. My first thing to say to anyone thinking about this is that if a 1000+ book that is a very slow burn with several sub-plots and footnotes isn’t something that tickles your pickle, then this book is probably not one for you. I would say if you like fantasy or historical fiction maybe give it a go and try the first 100 pages or so if you do want to just step outside of your comfort zone, just to see if you like it. On the other hand, if you appreciate all of those things and like a book that reads as if it was a very approachable, borderline fantasy book by Dickens then you will more than likely love this. With that brief introduction over, I have to say I loved this book. It probably could have done with being 200 pages or so shorter but then, I enjoyed every minute I was either listening to or reading this. It straddles the borders between several genres of fiction – all of which I do enjoy – there is historical fiction, fantasy, it reads as if it were written by Dickens and has that approachability of a YA novel and I just loved that. The characters themselves were incredible. Mr Norrell is detestable yet oddly endearing; I found I liked him much more in the first half of the book than the second but, then, the first portion of this book is primarily Norrell with only a smattering of other characters. Jonathan Strange isn’t actually introduced until the 250 page mark and is a character who I did find interesting but somewhat annoying, he’s much more likeable over the course of the novel than Norrell and the twist in his story towards the end of the second section did break me a little. What I particularly liked is the downward spiral from that point in to the third section where things become desperate. What I loved so much about this is that the characters were severely flawed. I appreciated that magic couldn’t solve all their woes. As I said above, the downward spiral of Jonathan Strange over the final third of the book was one that I could hardly put down. I actually read most of this book over the period of the bank holiday weekend because I was just so enthralled by it all! The research that must have gone in to this book is also incredible. Susanna Clarke has written a fantasy novel which is based around the Napoleonic War and the affect on England and in spite of the magical elements it is historically accurate. Some of it did read more like an academic work; there are long arguments of why some magic can or cannot be done, citations from works of magicians who are long dead with footnotes which are insanely long (and I found really interesting though, I can understand why some people hate them!) There is also this grasp on the age in which Strange and Norrell are living which makes this feel very authentic in it’s efforts to come across as a 19th century novel. I really can’t express my love for this book enough. It took me a month to read in full, but 600 pages were read over 2 days in the end. It was a slow, meandering read and I appreciated that. I’m still torn as to whether it is a 4* or a 5* book so I’m going to say it’s a 4.5 for now. However, I’m very excited to now go and watch the TV series, I just hope it lives up to the novel! All My Friends Are Superheroes is a sweet book just over 100 pages. It is one that I have had on my radar for quite some time but only actually picked up a few months back. I’m really glad I took an hour out of my day to read this. Like the title suggests, we follow Tom a man who has friends who are all superheroes. Now, they’re not your cape-wearing, crime fighting type but they’re every day superheroes with mundane super powers. There’s The Amphibian who can live both on land and underwater; Hypno who can hypnotise like a pro and Tom’s new wife, The Perfectionist, whose source of power is her need for order. Anyway, we follow Tom – our perfectly normal protagonist – and flash back through Tom and Perfs relationship and he tries to think of a way to get her to see him again after Hypno made him invisible to his wife. There are interludes where we learn about other superheroes and their powers and that’s quite a nice touch – doesn’t add much to the story but was nice nonetheless. This is a perfectly sweet little book that I read in about an hour. It had all the elements of a fairy tale, the right amount of romance and just enough silliness to make me smile. It was good, not mind-blowing, and just really short and sweet. I can’t really say much more about it, it’s only 112 pages long so I don’t want to spoil it completely! All I will say to tie it all up is that I’m glad I read it and would say, if you have an hour and this on your shelf, don’t put it off because it’s a really nice little read – 3/5 from me on this one.